Playing four handed in a SNG when you’re the big stack is great. Not only are you very likely to make the money, but you get the chance to use your opponents’ fear of getting fourth place against them. When you have the most chips at the table no one mistake can cost you your tournament life so there is less pressure on you to play perfect and you’ll often find yourself with easy decisions. On the other hand, when you have an average sized stack one wrong move can take you out and the decisions you’re faced with are often difficult. 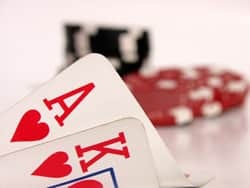 One of the main reasons why playing an average sized stack four handed is so difficult is that you’ll frequently find yourself in a position where moving all in is too drastic, but making a smaller raise (with the intention of folding to a reraise) will put a significant chunk of your chips at risk. A good rule of thumb is if you have 6 times the big blind or less you should either move all in or fold. That doesn’t mean if you have seven or eight big blinds you shouldn’t go all in; it means if you have six big blinds or less it doesn’t make sense to put chips in the pot if you’re not willing to go all the way with that hand. Conversely, when you have 10 times the big blind or more it rarely makes sense to move all in. When you move in with a stack that’s 10 times the big blind or more you’re risking a lot to win a little. If someone behind you picks up a monster hand they’ll potentially take all of your chips and if no one has anything you’ll just pick up the blinds. If you have such a strong hand that you want to get called it’s more likely that you’ll get action when you make a smaller raise and if you have a weaker hand you’ll give yourself the chance to get off of it if someone happens to find a monster hand behind you. If you’re in a tough game where you think a smaller raise with encourage another player to move in with a wide range of hands, then you should avoid making smaller raises in an attempt to steal the blinds and wait for a good hand. Maybe the most difficult situation is when everyone has about the same number of chips and the blinds are big but not huge. In a spot like this you should have at least a 75% chance of making the money if you’re not outclassed by your opponents so you should certainly do what you can to avoid 50/50 situations where all of your chips are at risk. Think about how your opponents are playing and adjust your style accordingly. If they are playing passively and it seems like everyone is just trying to squeak into the money you want to be more aggressive, play more hands and try to accumulate as many chips as you can. If you’re up against a bunch of maniacs who are moving in on every hand you should stay patient, wait as long as you can for a real hand, and give the other players a chance to make a costly mistake. At the very least after a few hands the chips stacks will shift around and you’ll find that someone (hopefully you) is the big stack, someone is the short stack and it will be more clear what you should do with various hands. When this happens you should attack the players with fewer chips than you and in close situations avoid attacking the player with more chips than you. When you’re short stacked or even average stacked your first priority should be to make the money, but when you’re the big stack you need to focus on outright victory. It’s worth taking some chances in an effort to grind your opponents down so that when someone eventually goes broke you’ll be so far ahead that you’ll be an overwhelming favorite to finish in first. Usually the blinds will be so big that just picking up a few sets of blinds (and more importantly taking them from the stacks of your opponents) can be a big deal. While it might be tempting to do plenty of folding and just cruise into the money, that is the exact opposite of optimal strategy. You want to do a ton of raising when you are the big stack four handed. The key factor here is the idea that no one wants to finish in 4th place. In fact some players are so afraid of going broke in 4th place that they’ll fold very strong hands even when they know the big stack could be raising with anything. And certainly only the very worst players will put all of their chips at risk with a marginal or weak holding playing four handed. Equally as important is the fact that if you do get called and lose you’ll still be in the tournament. However, if your opponent loses they’re out. The best players to attack are the ones whom you have significantly covered, but who are still in fair to good shape chip wise. Frequently the short stacks will decide they’re in trouble one way or another and decided to call with marginal hands and if an opponent has almost as many chips as you it might not be worth the risk to go after them. But if everyone folds to you in the small blind and you’ve got twice as much as the player in the big blind, put the heat on. The best case scenario when you’re the big stack is to have one player who is very short stacked and should go broke in the next hand or two. Knowing they’ll almost certainly make the money if they just fold, the other players will play extremely tight and allow you to walk all over them. On these occasions it frequently becomes correct to raise all in with any two cards. For example, let’s say with blinds of 200/400 you’re on the button with 7,100 chips, the small blind and the big blind each have 3,000, and the under the gun (UTG) player has 400. The other players know that the UTG player is going to be all in on the next hand with two random cards and aren’t going to risk all of their chips unless they pick up a huge hand (probably AK or a pair JJ or higher). You should move all in here without hesitation no matter what two cards you get dealt (yes, even with 72). Almost every time it’s going to be 600 more chips in your stack and 600 less in your opponent’s stacks. On the rare occasions you do get called, you’ll still have a chance to win the hand (which will put you in fantastic shape), and even if you lose you’ll still have 4,100 and with the super short stack about to take the big blind you’re still a massive favorite to make the money. Of course it’s not always such a clear cut situation, but you still need to move in with more hands than you might be used to. Imagine the same scenario except now the UTG player has 1500, you have 6,000 and the blinds still have 3,000. What kind of hand do you need to move in here? Now you have fewer chips and since the UTG player has more, it’s less likely that he’ll go broke right away. In this spot, while it doesn’t make sense to move in with every hand, most hands will do. Any hand that contains at least one ace or face card and all of the pairs are good enough to move in here. I would also move in with hands like T9, T8 suited and 98 suited, but would fold any hands worse than that. If you happen to know for a fact that you’re up against tight players you can add more hands to the list and if you think you’re likely to get called because the players in the blinds are loose then you should be a little more selective. Remember, when you’re playing 4 handed you need to take on a fearless attitude. If you’re afraid of finishing in 4th place it will be difficult to stay aggressive and take the risks it takes to be a long term SNG winner. Don't kick yourself if you make a mistake or get unlucky and miss the money by one spot. Getting a few fourths is fine as long as you have enough top three finishes to make up for it. Go back to Part I of the Four Handed SNG Article.